Ever wanted to take a metal pole and stick it into a zombie and watch their blood just drain out of it? 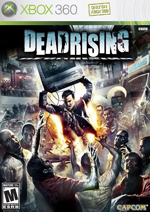 Ever wanted to take a chainsaw and tear through endless hordes of flesh, blood splattering everything in sight? Well then this is a game for you. 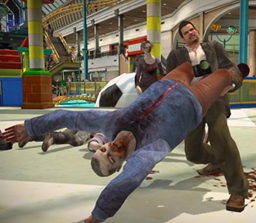 You play as Frank West. A Journalist wanting what all journalist's want... A good story. Well on a random chopper he see's a horde of zombies eating a frightened pedestrian and a few blocks down is someone sprawled on top of their car while zombies are clawing at his feet. 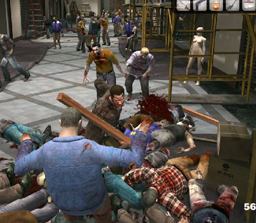 You are suppose to take pictures of the zombies and the more zombies you get on film the more PP points u get (prestige points) to level up and get new ability's (one where Frank walks like a zombie and you can walk through huge crowds of zombies and they don't attack you at all) and stat increases. 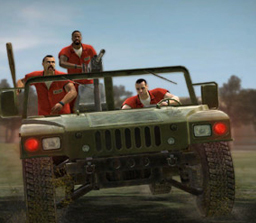 The game offers much playability. You can get different costumes and some ridiculous headpieces like in the cutscenes where Frank is trying to be serious and he has a lego helmet on. There are so many weapons that there are endless possibility's. From chainsaws and scythes to hot frying pans and throwing popcans, the action is very gory and enjoyable. I picked up a bench and tossed it through hordes of enemies knocking over all of them. You can take a shower head and stick in the zombies head and it drains their blood through it. After completing a certain achivement, you get a"Mega-Man" gun that can literally take bosses down in 3 shots. This game when i'm having a bad day, can put in kill some zombies and it feels great. Everyone should own this game. What do you think of this game? 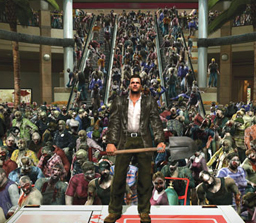 Click here to discuss Dead Rising in our forum.